Production assistants give practical support to the director and production team during the making of films and television programmes. They handle administrative and organisational tasks so that the production runs smoothly and on time. While duties do vary from production to production, the work includes assisting actors and the crew, running errands, and sorting out enquiries and other paperwork. Production assistants are involved in a wide range of tasks before, during and after filming, which could include: hiring studio facilities and equipment; booking hotels and making travel arrangements; attending production meetings; copying and distributing scripts; typing and distributing schedules (call sheets) and daily reports; getting permission to use copyrighted music or film clips; dealing with accounts and expenses; compiling details of programme requirements and arranging artists’ rehearsal times; assisting with the preparation of music, written material and photography; advising studio floor personnel of camera cues; keeping records of filmed sequences for visual and narrative flow. What does your job involve? Production Assistant (PA) is an entry-level position for people hoping to work in the television industry. A PA is expected to do a variety of jobs, from booking and arranging shoots to logging and transcribing of footage. You are expected to be versatile, hardworking and prepared to do the arb jobs – it is the only way to properly understand the dynamics of television production. How did you come to be in this profession? 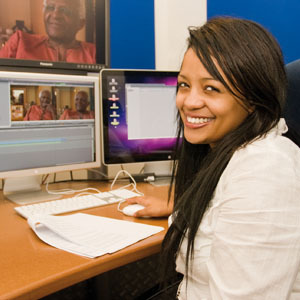 First, I completed an Honours in Journalism degree; my desire has always been to go into broadcast media. No university can properly equip you with the skills needed for TV production. It is therefore very important to get as much experience as possible. I hope to produce my own production someday and, therefore, working at the bottom of the food chain as PA is where one has to start, until you’re set to run your own show! What training did you undergo? I went to the University of Stellenbosch, where I did a Bachelor of Arts degree in Political Science, followed by a postgrad Honours degree in Journalism. What makes a good PA? One has to have a passion for what you ideally hope to do. PA work is a springboard to your future. Perseverance and commitment to yourself and the quality of work you produce is essential. How does experience weigh up against training? In my opinion, both are fundamentally important as the one compliments the other. Get as much as you can of both. Describe a typical day Every day is different. Some day we have shoots, then there are days when we just edit. Shoot days are the most exciting: get to work and prepare equipment (cameras, lights, sound equipment, etc); make contact with the subject of the shoot; double check that all is in order; if necessary, have props and extras ready; once at the shoot, be ready and available for whatever might come your way. What do you like the most about your work? The amazing people I meet. I work for the documentary-making section of ETV, where we focus on social-historical documentaries. We do biographical pieces on many influential people, like Arch Bishop Tutu, former president Nelson Mandela and FW de Klerk. What don’t you like? Every job has its down side, and for a PA it’s probably not having a specific job description. You are expected to be as dynamic and versatile as you possibly can. This can become exhausting at times. Career highlights? What is always a major highlight for me is working hard on a documentary and being able to look at the final product with a feeling of accomplishment, knowing you were part of the team that produced it. What are your future goals? To have my own TV talk show. It’ll have a South African flavour – Oprah meets Felicia Mabuza, with a dash of Jerry Springer in Tarryn Kay style! Although many production assistants are graduates, this is not essential as most employers will be more interested in experience and personal qualities than qualifications. It isn’t essential to have studied film, video or media production, although it would be helpful to take a course that includes practical skills, work placements and the chance to make contacts. Several colleges and universities offer relevant courses. In-service training is provided on most aspects of programme and film production, although some of the careers in film and television production need special training and experience.